Winter has arrived! Snow and cold is in the forecast. We hope to see you this week at our group fun runs and the holiday lights pub run! 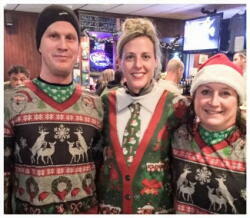 Thur Dec 15: Free Ugly Sweater Holiday Lights Pub Run at 6:15pm from Coliseum Bar Madison. 3.2 & 5.4 mile route options through the holiday lights display in Olin Park. Option to wear test a Craft USA baselayer on your run. An ambassador from Ragnar Relay will also be with us to answer any questions you may have regarding their annual events. It's going to be a fun time. If you can please RSVP via our facebook event. Join us for our Annual Fleet Feet New Years Day Dash to bring in 2017!